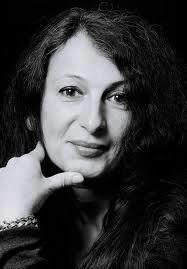 Carmen-Francesca Banciu is the author of six novels, several short story collections, critical essays and a radio play. Born in Lipova, Romania, she studied religious painting and foreign trade in Bucharest, and began publishing short stories in the 1980’s. In 1985 she was awarded the International Short Story Award of the City of Arnsberg for “Das strahlende Ghetto” (“The Beaming Ghetto,” 1985). As a result of this award, Banciu received a publication ban in Romania. In 1991, she accepted an invitation extended by the DAAD Berlin Artists-in-Residence program and went to Germany. Opting to remain in Berlin with her young family, Banciu embraced German as her primary literary language, debuting in her new tongue with her memoiristic novel, Vaterflucht (Flight from Father). Banciu’s works are critically acclaimed and have been translated into eleven different languages. The themes of individuation under authoritarianism, female empowerment, self-reinvention, immigration, post-Communist consciousness, and contemporary Berlin are central to Banciu’s works. In 2016, Banciu made Loren Kleinmann’s Most Badass Female Protagonists list in Huffington Post. Banciu’s most recent novel, Lebt wohl, Ihr Genossen und Geliebten made the Long List of nominees for the 2018 Deutscher Buchpreis.